Slice Geometry started life as an updated version of Moment Macro from JHU, which was modified to run over all slices in a stack. The resulting macro was then ported to Java to exploit the substantial (~ ×100) speed advantage that results from running in native Java rather than interpreted ImageJ macro language. It calculates cross-sectional geometric properties of shapes: cross-sectional area, centroid, mean density, second moment of area, section modulus, Feret diameter and local thickness (2D and 3D). Measurements can be limited to a rectangular ROI. 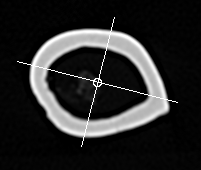 If your bone is not well aligned with the image axes, you may find it useful to align the bone to its principal axes using Moments of Inertia or by exporting a transformed volume from the ImageJ 3D Viewer. Importantly, no assumption of geometry is made for any of the measurements. This file last modified 2042hrs 13 September 2016 © Michael Doube 2004-2019 :: Designed to be interoperable and standards-compliant.